Here's a quick look at the new Metallic Shades available at American Apparel. These are available on their web site here, and they retail for $6.00 each. Isn't this the first time they've strayed from their creme formula? I could be mistaken about that, but I know I don't have anything but cremes from them! I'd be interested to hear how the formula is on these new shades, and I'm loving the bronze/copper one. I'm liking the look of Bronze Dash the most. It will be interesting to see how they do another finish besides creams. These look really nice. 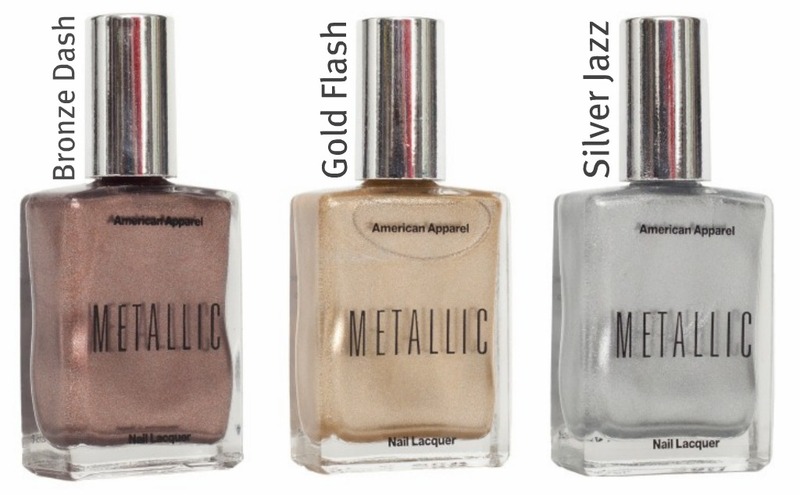 I own one polish by American Apparel. Love to own them all! Omg!!!! This made my day! I love it! I can't wait to own them!